"Super Moon - Blue Moon - Blood Moon - Copper Moon - Eclipse"
In the evening of 31 January this year, as we look towards the eastern sky, we can see, once again, the dance of shadows that our Solar System regularly conjures up, as our Earth and the Moon move inexorably in their cosmic orbits around the Sun. This Total Lunar Eclipse is being described variously - super-moon, blue moon, blood-moon, copper-moon etc. What is important is that we all go outside and see this majestic spectacle that nature will orchestrate for a few hours, and also that we get our friends, family, and our communities to share in it too. The totality part of this eclipse occurs from 6:22 pm IST to 7:38 pm IST and can be seen in India from all places where the moon has risen. The moon will rise later as we move westwards, from 5.17 pm in Kolkata, to 5.54 pm in Delhi, to 6.04 pm in Chennai, to 6.27 pm in Mumbai. If you are organising a local event where members of the public can come and watch the eclipse with you, please do register your event with us below. We will then put your event on our map, so that others can join you as well. If you have a small telescope, that is great, but we can all enjoy the eclipse without one too, so do not let that stop you! The ASI-POEC has created a resource base on this page for anyone to see and share the eclipse. Scroll below for Maps and Tables, Event Lists, Info, Resources in English and other Languages, and a Glossary. 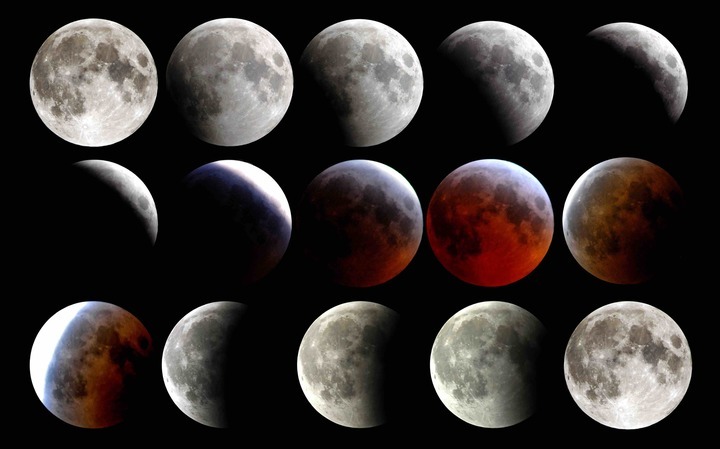 The various timings associated with a lunar eclipse are the same for all observers on the Earth. For example, the exact time that the shadow of the Earth crosses the limb of the Moon will be the same for all of us. However, since the Moon will rise just around when the umbral eclipse starts, in India, different places will start seeing the eclipse at different times. This is just because, as the Earth rotates on its axis, the moon rises later and later as we move westwards. So, all you need to do is find out when the Moon will rise for your location, and look up the table of eclipse timings to figure out which stages of the eclipse you can catch. That's all! To find the time of Moon rise for your location, and figure out which stages of the eclipse you can see, use this handy calculator made by Alok Mandavgane. Click Telescope icons for details. Do check back again as events are still being registered. We hope all of you get to see this eclipse for yourselves out in the open. However, in case you are unable to do so, because of clouds etc, you can still enjoy the eclipse through these webcasts. A very useful site for timings, figures etc is this one. This website has a page on every single solar and lunar eclipse as well! If you google for lunar eclipses, you will find stunning pictures of a red-coloured moon. If you would like to try your hand at photographing this eclipse, see here, here, here, here and here. How do I see the eclipse? A Total Lunar Eclipse is very easy to enjoy, you just have to go outside and look at it! Find a good location beforehand, maybe a couple of days prior to 31 Jan, where you can have a clear unobstructed view of the eastern sky, down to the horizon. Make sure that there are no bright lights nearby, since the Moon will be rising when it is already eclipsed. If you are hosting a public event, you may want to ensure that there is plenty of space for people to move around safely. Once you decide on the location, get there sometime before Moon rise on the day of the eclipse. You can even note the rough location on the horizon where the Moon has risen from, the previous day. It will take some time to locate the Moon since it will be in the shadow of the Earth. You can even have a competition among the people present to see who spots it first. Once you have located the eclipsed Moon, you are set. Just follow it as it gets higher in the sky. At 7.37 pm, it will start leaving the shadow. The part that is now out of the shadow will be much brighter than the eclipsed part. By 8.41, the entire Moon would have left the umbral shadow. Though the Moon will be covered by the penumbra till 9.38 pm, this penumbral part of the eclipse will not be as spectacular as the umbral eclipse. If you have a small telescope or a pair of binoculars, the partially eclipsed Moon will look beautiful through it. Make sure that you have a long focal length eyepiece so that the entire disk of the Moon can be seen in the field of view. But … is it ok to see it? Yes! It is absolutely okay to see the eclipse, and share the joy of the event with people you know. We need to take precautions while seeing a solar eclipse. Any accidental viewing of the uneclipsed part of the Sun, especially through a telescope, can permanently damage the eyes. Even so, hundreds of millions of people regularly see solar eclipses safely using solar filters and other devices. There is no such danger for a lunar eclipse - after all, we can all look at the un-eclipsed full Moon without any problem! So, you can see the eclipse with your naked eyes or using a telescope and you can eat during the eclipse. In short, there are no harmful effects from seeing the eclipse on 31 Jan.
An eclipse is one of the most grand and awe-inspiring spectacles that nature has to offer us. Why would we not want to see it? 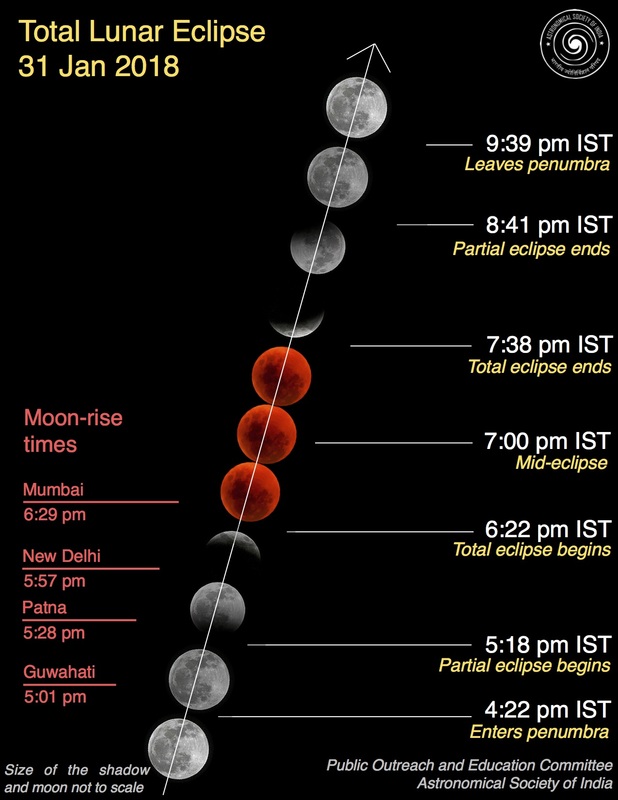 This site has brief descriptions of the lunar eclipse in many Indian languages, including a comprehensive FAQ. "Lunar Eclipse for Beginners" by Mr Eclipse himself, Fred Espenak. Another simple explanation here. And, of course, wikipedia. "The Lunar Eclipse of 31 January: Here's everything from science to superstition about the rare celestial event"
"From fear to understanding - what can we learn from Aryabhata"
an article on the history of eclipse studies in India and abroad by Niruj Mohan Ramanujam. A basic intro to eclipses, by Arvind Paranjpye, Nehru Planetarium, Mumbai. "How do I watch the total blue moon eclipse? ", an answer by B.S. Shylaja, Jawaharlal Nehru Planetarium, Bengaluru. A primer on the eclipse by Rathnasree Nandivada, including ideas for hosting a Moon Carnival. A reader on the eclipse by Arvind Paranjpye, with more ideas for what to do during the event. A tutorial on measuring how super the super-moon eclipse is, by Nandivada. A tutorial on measuring crater timings during the eclipse with a telescope, by Rathnasree Nandivada. A tutorial on measuring how dark the sky will be during the eclipse, by Rathnasree Nandivada. "Mumbai to watch once in a blue moon event on Jan 31"
"Total Lunar Eclipse on Jan 31 to be visible from India"
"Once in a blue moon, literally"
"Once in a blue moon treat for Kolkata"
"A rare celestial feast is on the way"
"வானில் வரப்போகும் சூப்பர் நீல நிலவு கிரகணம்"
The Moon's orbit around the Earth is not a circle, but an ellipse. Hence, the distance to the Moon varies slightly as it goes around us, from roughly as low as 3,62,600 km (perigee) to as far as 4,05,400 km (apogee). 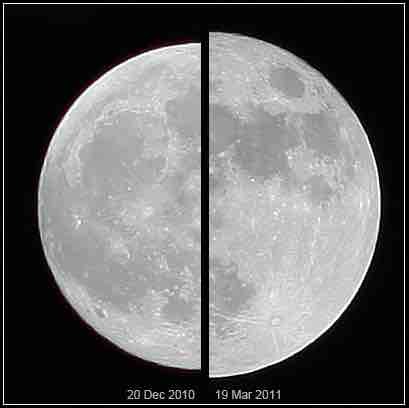 This makes the perigee Moon around 14% bigger and 30% brighter than the apogee Moon. When the perigee, or the closest approach to us, coincides with a Full Moon, it is called a Super Moon. The next perigee is on 30 Jan, at 3.30 pm IST. Hence, the Total Lunar Eclipse the following day is being called the Super-Moon Eclipse. For more info, look here and here. The time from one Full Moon to the next is 29.5309 days. 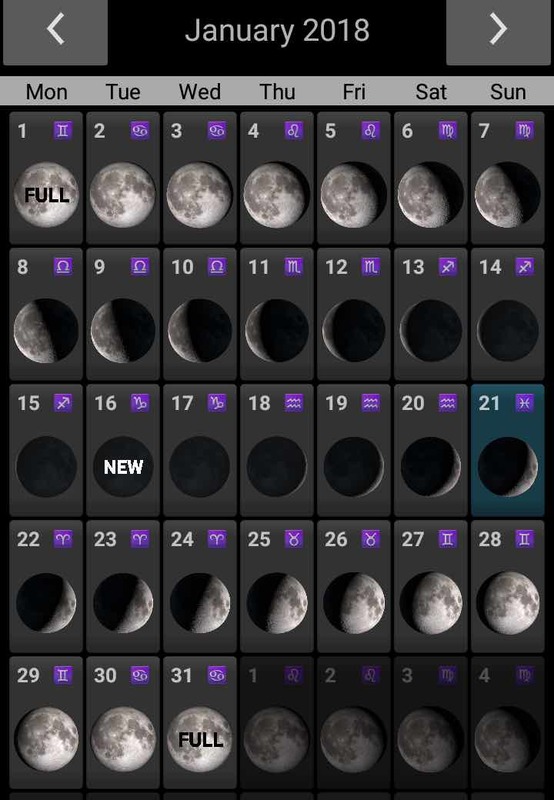 This means that we usually get one Full Moon every month. However, 12 such periods adds up to 254.37 days, which is roughly 11 days short of a full year. Every 2.7 years, therefore, these 11 day excess adds up to one full lunar month. This will then cause two Full Moons in a single month. And this is the modern definition of a Blue Moon. In January 2018, we have a Full Moon on 1 Jan, and again on 31 Jan, the day of the eclipse, giving us a Blue Moon eclipse. For more info, see here, here and here. Did you know that the blue colour of the sky and the reddish rise and set of the Sun and the Moon are connected? Sunlight has all colours in it, but the molecules and dust in our atmosphere scatters the bluer light more than it does the red. Hence, the sky is blue all over. The light from the Sun and the Moon travelling though a long path in our atmosphere at rise and set time, is thus reddened. During a Total Lunar Eclipse, the Earth blocks sunlight from reaching the Moon directly. However, the red light from the sunrises and sunsets can pass through the edges of the Earth, and can refract on to the Moon, making it red in colour. Hence the name, Blood Moon or Copper Moon. The webpage has covered all the essential details required to address the events. The information is shown in a concise manner easy to read and comprehend.The diagrams and videos are very helpful too. The section for viewing information on different languages will be highly helpful to people who may not be comfortable with the English language. Also it will reach out to that section of the society who has misconceptions about such events as has been rightly pointed out. People must be able to enjoy this lifetime event. The page is quite user friendly and viewers will have no problem navigating through it in order to retrieve all the information required to know more. Also, there is plenty of resource material. “Register your own event” also makes it fun and enjoyable. Where can I find a public place or a telescope to see this lunar eclipse on 31 Jan. I belong to Delhi pin code 110051 & 110006.